G.U.S.S.O.M.O. is the oldest, continuous Computer (formerly Play-By- Mail) Strat-O-Matic Draft Baseball League in the United States. Our League started in 1971 as a "straight team" replay (league members managed the actual Major League teams). Jeff Fleischman is the Commissioner of the League. Jeff "volunteered" to take over the reigns of the League shortly after the beginning of the first year when the original Commissioner (who was in the Air Force at the time) informed all the Original League members that he was being transferred from Northern California to Germany and would not be able to continue running the League. He sent all the League material paperwork and statistics (minus, of course, the League treasury/dues) to Jeff who re-organized and cleaned things up and has been running the League ever since. League Name: At the time that Jeff took over as Commissioner, our League did not have a name. Jeff felt that he needed to come up with a name for the League that captured the geographical expanse (all over the United States) of our organization... and.... taking into consideration that the names that other Play-by-Mail Leagues in the late 60's and early 70's were using. Many of those other Leagues had names that started with the"Greater This or Greater That" .... and followed by where the League was based or where most of the member lived ). With this in mind, Jeff simply decided to call our League "The Greater United States Strat-O-Matic Organization. "While perhaps not the most creative of league names, for 49 years, many people have heard of our League and have participated in what is truly a great S-O-M League ... a League that is simply known as.... G.U.S.S.O.M.O. We have had many members over the years..... however, many of our managers have been in G.U.S.S.O.M.O. for well over 25 years! The average number of years that a current manager has been in our League is about 20 years. Larry Steinberg (from Chicago) was the only other manager from our first season that is still in the league. Larry took a couple of years off from the league (many years ago). Larry has been in the League for 38 years. Mike Volberding, an original member in 1971 has rejoined the League and has been with us again since Season # 45. Bob Galvin, a member of the League for 20 years in the 70's, 80's and 90's also has rejoined the League 3 years ago.... (QUESTION..... is SOM and G.U.S.S.O.M.O. a "tie that binds?"... you bet it is!). Ralph Polumbo has been a solid member for 42 years and Mike Lefkow is now in his 40th year managing the Concord Grape. Dave "Peach" Taylor (former Manaager), guided the Georgia Crackers for 32 years before moving into retirement and horseback riding... and Nick Romano managed the Italian Stallions for 34 years before deciding to leave the League. Mike Lefkow will be starting his 40th year in the League. One the best parts of G.U.S.S.O.M.O. (and perhaps the key factor with regards to the longevity of our League) is the camaraderie and the friendships that have been formed over the years. It is truly amazing to look back on the beginning of G.U.S.S.O.M.O. and realize that most of the managers were in High School or Junior High School. 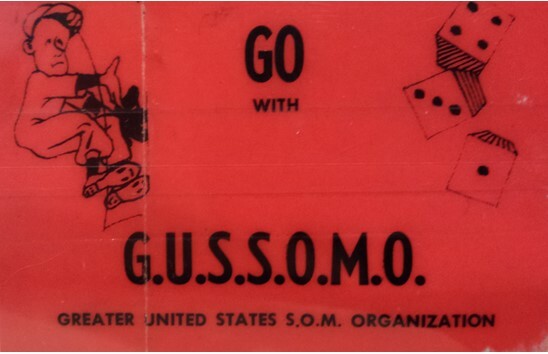 An even scarier fact is that some of the current managers in G.U.S.S.O.M.O.weren't even born when the League started... back in 1971. The Commissioner remembers very clearly the first time he met one of the current league members (Ralph Polumbo) in 1981. "While taking vacation on the East Coast, I had the opportunity to meet Ralph at his home when he lived in Connecticut. Ralph and his wife Alice were very friendly and hospitable. We did some site-seeing, went out to dinner with another manager (Earl Brock) and his wife. Ralph and Alice were also the parents of two very small boys. I remember that one of their sons was sitting in a baby seat/highchair in the kitchen. I can't remember if it was John or Will, but in any event... both of Ralph's son's are now in the league, married and have kids of their own (John 3 and Will 2). And by the way... both John and Will are very good managers! (O.K., it was probably Will in the car seat... he's younger... and now that I think about it... he just might be a better manager than his brother John, who graduated from Syracuse University and is employed as a television/news/broadcast producer near Jackson, Mississippi). Will has finished up his studies at the University of Michigan and is working is sales/product management for an industrial equipment company. A few other thingsabout G.U.S.S.O.M.O.While only a hobby, has played a big part in many of the managers lives for many years. We've done a lot of "interesting" things over the years .... from being a bunch of "crazy teenagers" running loose. "down by the East River and riding the subways at 2 AM in New York City (we went to the 2nd SOM convention at Abraham & Strauss in 1973) ... to playing some of our games over the phone. In fact, Jeff reportedly played the first SOM League game versus an opponent on the phone "long distance." The game was played versus another League member... and both managers rolled their dice inning by inning for their own teams, reading off the results as the game progressed. Jeff lived in Southern California at the time while the other manager lived in Ohio. Many years ago, our League started having an annual "Get-Together". The Get-Together is usually in the city of one of our League members. Over the years we have had our get-togethers in cities such as Chicago, Atlanta, Philadelphia, Kansas City, Pittsburgh, Cincinati, Detroit, St. Louis, Milwaukee, Denver, San Francisco/San Jose and Minneapolis. At least 1/2 of the league members (plus wifes and families) usually attend our "long weekend" Get-Togethers. Most of the time, a host manager makes all the arrangements for the group of managers... including Hotel Suites (with a meeting room so we all can play of our games face-to-face... with lap top computers spread all around the room), barbecues at the host's home, and tickets to a Major League Baseball game. It should also be noted that our League prides itself on being a "class organization." While playing our games is what the Get-Togethers are all about, we have made it a point to promote a certain level of style and "culture" for our members. Over the years, we have made time to attend some of the best local "ballets." including the little known, but very popular "Cowboy Show" in Windsor, Ontario, Canada. As many of the members travel around the country (today, it's usually on business), we seem to make it a point to try to get together with the manager/friend that lives in that particular city. Isn't it crazy how a game can lead grown men to still act like kids? It's hard to believe that G.U.S.S.O.M.O. has been around for so long.... but we're all still just having fun... and I suppose that we'll keep on rolling... or (as the case is nowadays) pushing those computer keys... for years to come. THE FUN WE'VE HAD PLAYING STRAT-O-MATIC!